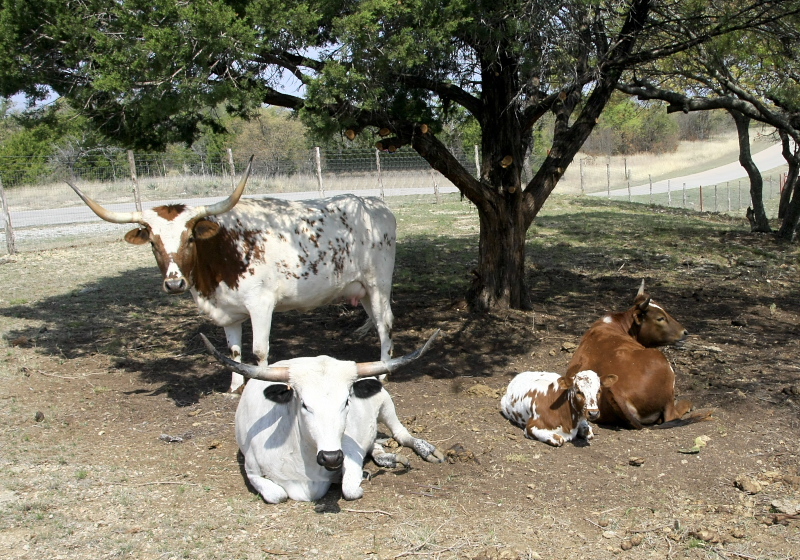 Many of you may recall my photo from a few years ago, "Longhorns in the Shade." 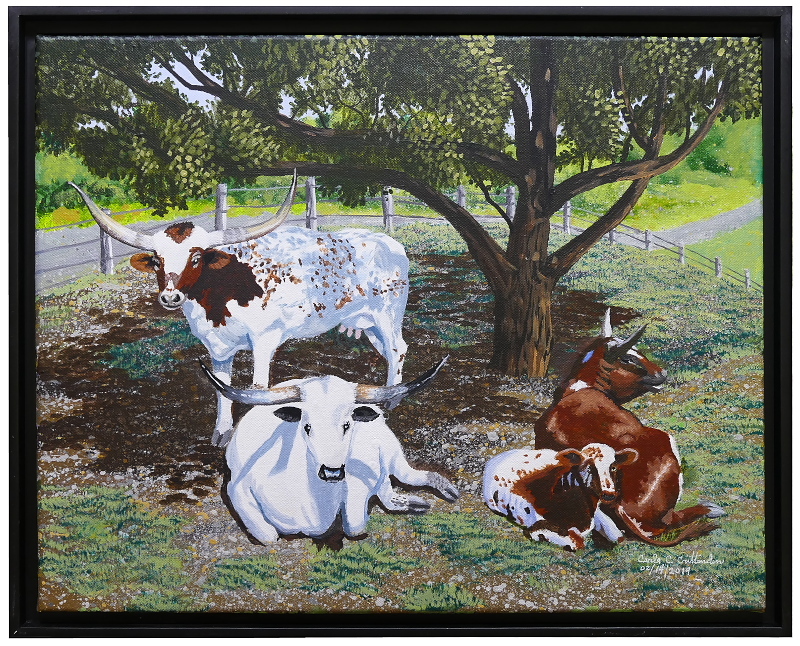 It shows a family of longhorn cattle in a small temporary pasture at the corner of two country roads near our home in Weatherford, Texas. Carla has continued her study of painting with acrylic, now studying under a very accomplished local painter. For her most recent project, she decided to paint from that photo. The result is just exquisite. The work was Carla's Valentine's gift to me. I am just thrilled! It is, by the way, mounted in a front-mount shallow shadowbox frame, so the painting had to have full wrap bleed. You knew I was going to love it. At first I thought it was a new photograph! That cow on the left has fabulously engaging eyes. Great you don’t have prides of lions prowling around! Here we have mountain lions, but could they take down a longhorn? You knew I was going to love it. It was really a daunting project, and I am so proud of Carla for pulling it off so well. A nice copy of the photo but what is going on with the fence? It seems to be dropping down hill. Well, that's just how the terrain works. Indeed. the slope of the ground with the fence is greater in the painting than in the photo. Now don’t rest on your “Longhorn Laurels”, Doug and Carla. Go and find those critters and get more winners. This is a favorite but time it had siblings! Congratulations to Carla for the excellent work. Yes, I am so proud of her. I’ve always thought Carla and you make a great pair, but this cooperation in art is simply perfect! I hope this is only the first such collaboration. Let’s have many more! Tell me, Doug, now that you are equipped with an even better camera than you had way back when you took the notable original longhorn picture. .....and Carla then would have more homework!